Every article you publish has an article tile that provides information about the article. The article tile appears in the topic and channel feeds and in the reader’s For You feed. Your article tile can incorporate information from your ArticleDocument properties, your article Metadata, your Create an Article request, and your channel name. thumbnailURL, videoURL. 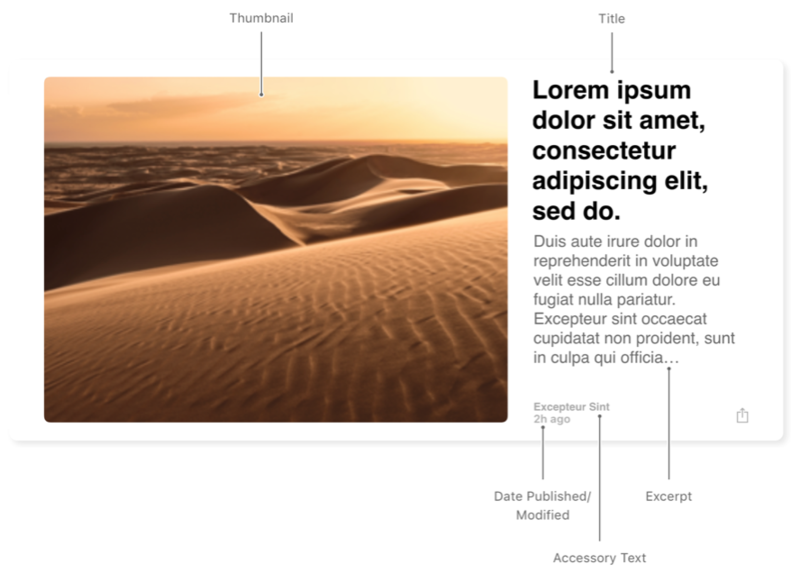 Use the thumbnailURL property in the article’s Metadata object to specify the image you want to use in the article tile. Optionaly specify the videoURL property. When both thumbnailURL and videoURL are provided, the videoURL is displayed in the article tile. See Guidelines for Using Images, Videos, and Audio Files. title. Use the title property in the ArticleDocument object to specify the article’s title. datePublished,dateModified. Use the datePublished or dateModified property in the article’s Metadata object to specify the date the article was published or most recently modified (after publication). Accessory text properties. This is the text (like a byline or category label) that appears below the excerpt in your article tile. In the For You and topics News feeds, this text is the channel name. In channel and section News feeds, this text is (by default) taken from the authors property in the article’s Metadata object. You can override this default by specifying the accessoryText in the Create an Article request to the Apple News API. If neither authors nor accessoryText contains text, then the channel name is displayed in the article tile. excerpt. Use the excerpt property in the article’s Metadata object to specify the summary of the article. Although it’s optional, try to include an excerpt for all of your articles.